Last measured at the 2015 EuroCamp at 6'8.25 in shoes with a 197-pound frame and a 6'8.25 wingspan, Dzanan Musa measured 6'9 with a 6'8.5 wingspan while tipping the scales at 195-pounds. Musa's lack of great length is a concern at the NBA level, but he offered some answers to those questions about his defensive ability and approach today playing with great intensity and awareness in the final game of the day. Willingly getting his teammates involved and showing the type of unselfishness and maturity that scouts want to see from him, Musa didn't post huge numbers, but had an extremely positive performance nonetheless guiding his team to a blowout win, doing a number of little things to help them come out victorious. 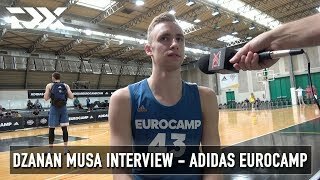 Bosnian wing Dznana Musa talks about his experience at the adidas EuroCamp, the season he just had in Cedevita, his background in basketball, his love for Kobe Bryant, and the type of player he is and wants to become. Musa, who was 17 years old for most of the regular season, averaged an impressive 9.2 points and 2.7 rebounds per game for Cedevita, seeing regular rotation minutes in EuroCup and Adriatic League play. Among the most hyped international draft prospects in recent memory, Musa had a prolific, but less than efficient showing at the FIBA U18 European Championship, where he averaged 20.2 points, 6.8 rebounds, and 3.3 assists per game after a dominant showing at last summer's FIBA U17 World Championships. A confident, aggressive scorer with instincts well beyond most players his age, Musa is a dynamic creator and shot-maker who will be tested against the talented group of prospects assembled here. NBA scouts love Musa's scoring instincts, but there are some question marks about how his average athleticism, hunched frame, and ball-dominant style of play will translate against better players. Make no mistake, though, Musa is one of the top prospects at this camp and might be watched more closely than any player in attendance. -Tremendous overall scoring instincts. Career 28 points per-40 in FIBA play. -Hot blooded player. Extremely competitive. Teammates on Bosnia seem to like playing with him. -Lacks a degree of strength and explosiveness as a finisher around the basket in traffic. Struggles to finish over length. Will he be able to finish effectively inside the paint against legit rim protectors in the pros? -Can he be effective without monopolizing the ball exclusively the way he did for Bosnia? -Mostly indifferent defensively, which is not surprising considering the heavy load he was asked to shoulder. Wingspan (6'8 ¼) measured the same as his height. Hunched forward in his stance, making it difficult for him to stay in front of quicker players. Outlook Widely considered the top talent in the 1999 European generation. Already saw minutes for Euroleague team Cedevita despite only being 16. Undoubtedly a tremendously skilled offensive player with outstanding instincts for putting the ball in the basket and finding the open man. Nonetheless, some real concerns about how that will translate to higher levels, especially if his attitude doesn't improve. Will his back be a cause for concern down the road? Dzanan Musa followed up his 2015 U16 MVP performance with another impressive individual display through seven games at the U17s, posting not only some of the best numbers seen at the event, but also some of the best we've seen in tournament history dating back to 2010. Musa led the tournament in scoring at 34 PPG (the tournament's best rate ever ahead of Rui Hachimura's 22.6 in 2014) and poured in 50 vs. Chinese Taipei. He showed off his entire offensive arsenal over the course of the tournament, demonstrating impressive guard skills for a 17-year-old 6'8 swingman. He continued to show improvement in his jump shot, knocking down 2.3 per game on nearly seven attempts. Musa exceled on the offensive end using his length and ball handling ability to make plays out of the pick and roll, and to get to the rim nearly at will both in the half court and in transition, averaging an impressive 15 free throw attempts per game. At just 17 years old, Musa has been very impressive on the international stage at the junior level, and now will need to show his style of play can translate to the professional ranks. Last season Musa came off the bench and played roughly 12 minutes per game for Cedevita, a Croatian Club that played in both the Euroleague and Adriatic League. Musa has shown that he can dominate players his own age, and his professional development is definitely something to monitor down the road. Dzanan Musa, the 1999-born small forward who dominated the one game he played here, measured 6'7.25 without shoes with a 6'8.25 wingspan and 187-pound frame. Musa doesn't have great length, but possesses nice height and a frame that should fill out nicely over time. Though NBA scouts only had the opportunity to watch him for a few hours, there's no question that Dzanan Musa left a lasting impression on those in attendance. Born in Bihac, Bosnia, but currently playing at the junior level for Croatian power Cedevita Zagreb, Musa is a 6'8 small forward with tremendous all around skills and potential. Leading the 2014 FIBA U16 European Championships in scoring at 22 points per game, despite being one of the youngest players in attendance, Musa poured in 23 points as the adidas Next Generation squad defeated the Benetton U17 team in an extremely competitive and entertaining game. Already possessing good size and length for the small forward position, Musa looked to assert himself early and often in this game. Flashing a complete offensive game, the smooth, skilled swingman knocked down a number of pull-up jump shots, used his quick first step to get to the rim, and even made some plays on the pick and roll. Finishing the game shooting 6-7 from inside the arc, 1-3 from deep, and 8-8 from the line, Musa was simply outstanding, even showing a willingness to get other players involved despite his success scoring on his own. He has excellent court vision, particularly on the pick and roll, and an advanced understanding of the game for a player so young. Though his catch and shoot jump shooting still has some room to improve, his floor game and shot making ability are extremely impressive for a player who can't even declare for the draft until 2018. He came into this camp with a reputation for being the top talent in the 1999 generation, and did nothing to dispel that notion in Treviso. As good as Musa was offensively, he was also quite impressive defensively, leading the game in rebounding while playing aggressive perimeter defensive, getting in a low stance, and effectively contesting a number of shots. An exceptionally mature and polished player despite having never stepped on the floor at the senior level, Musa is a player we'll no doubt be hearing from again down the road. Already carrying himself like an NBA player, he has a degree of confidence (some would say arrogance) which makes him an absolute monster in settings like these against players his own age.